So, it is time to close the door on 2017. Reviewing the headlines it feels like it was ultimately something of a ‘head down, get on with it’ sort of a year. As an industry we look set to start 2018 not much wiser as to where Brexit is taking us. Brexit Secretary David Davis’ admission in early December that Government has not carried out any impact assessments of leaving the EU on the UK economy came amid mounting concerns over labour shortages in the farming sector. Let us hope the Brexit bureaucrats find time to read the analysis produced by UK farming organisations during 2017. Glyphosate was in the headlines for much of the year, an overtly political process of lobbying and voting culminating in the herbicide’s reapproval for use for a further five years from December 2017. As we begin a new year it is time for those on both sides of the argument to put their differences aside and work together to map the way forward. I had the opportunity to attend the AHDB monitor farm conference towards the end of the year and was inspired by the willingness of the growers and agronomists present to challenge convention and explore new ideas. That same mindset was also very much in evidence a week or so later at The CropTec Show, where established industry names and brands rubbed shoulders with newcomers, bringing new ideas in areas including bioproducts and data security. It was the busiest show yet, reflecting the arable sector’s thirst for knowledge exchange as it prepares for business in the post-Brexit era. Don’t miss our event report in this issue. So, what does this year hold in store for UK farming plc? More of the same no doubt; the political, economic and agronomic challenges facing farmers and growers will not dissipate over night. And yet change is inevitable. But the farming industry has shown before that it can adapt successfully and it will do so again. January is, of course, Lamma show time. The 2018 show will be the last at the East of England Showground before Lamma’s move indoors to the NEC in 2019. 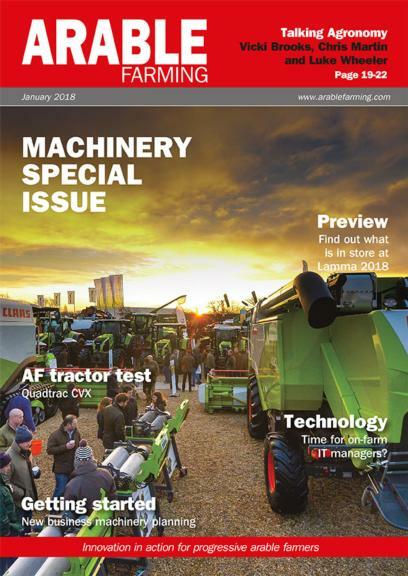 We’ve got all the essential information in our Lamma preview, together with a snapshot of just some of the new kit which will be on show and, we hope, some ideas and inspiration as well. We look forward to seeing you there.